If we had the ability to create a person who would that person belong to? If they were able to think critically, feel deeply with a yearning to be self- sufficient would they still belong to a creator or should they be set free without limitation. These questions are pertinent in our own lives but it is a central theme in the film opening this Friday at The Island House Cinema. From acclaimed writer/director ALEX GARLAND (28 Days Later, Sunshine) comes EX MACHINA, a chilling vision of the not-too-distant future of artificial intelligence. In the mountain retreat of a gifted internet billionaire, a young man takes part in a strange experiment: testing an artificial intelligence, housed in the body of a beautiful robot girl. But the experiment twists into a dark psychological battle, where loyalties are torn between man and machine. DOMHNALL GLEESON, OSCAR ISAAC and ALICIA VIKANDER lead the cast of Ex Machina, an intense psychological thriller, played out in a love triangle. The film explores big ideas about the nature of consciousness, emotion, sexuality, truth and lies. My favourite program at the Island House Cinema is the Caribbean Storyteller Series, in this series we feature current work Caribbean filmmakers and practitioners. 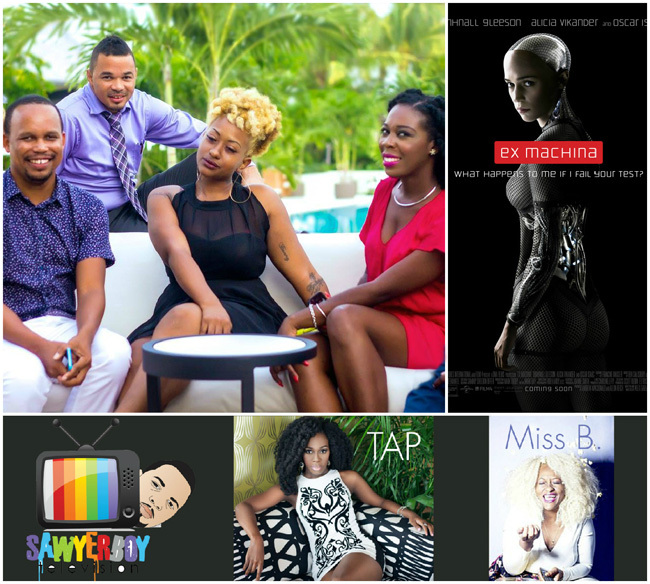 Last week at The Island House Cinema we featured three of the most prominent vloggers in the country. We engaged Sawyerboy, TAP and Miss B in a conversation about their work that was participatory with the audience. We will be showing this work again before the close of the series. Jeffarah Gibson from The Tribune writes that Shervante first came to audiences’ attention in the critically acclaimed Bahamian film “Rain” by Maria Govan. Since then, Shervante Nixon – also known as Miss B – has been paving a path for herself with humorous videos, steadily working towards becoming an online sensation and tapping into a new, lucrative market. A pioneer is defined as one who "originates or helps open up a new line of thought or activity" and although young and still growing, Bahamian entertainer, Tracy Ann Perpall; is just that. TAP, as she is best known, is truly the cultural voice of a new Bahamian generation. Whereas, there are personalities that create problems for society by teaching younger kids to do silly, irresponsible things, TAP shines a light on Bahamian society, using both humor and reasoning to create thoughtful and insightful perspectives. Her ideas not only reflect Bahamian culture, they have become Bahamian culture. Sawyerboy started to share his gift of comedy a little over two years ago and since that time has made a daily impact on both the Bahamian social media and internationally. He has a devoted following that stretches as far as Finland. Sawyerboy consistently produces content on a weekly basis and is widely known with Sawyerboytv's Bahamian Word of the Day. Every week Sawyerboy is able to reach 13,500 fans through social media.